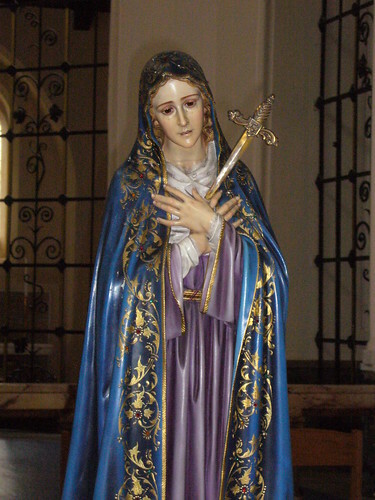 Our annual Novena in honour of Our Lady of Sorrows begins today and continues until the Feast Day on 15 September. Click here for the times of services during the Novena. Novena Mass is offered each day at lunch time and in the evening with a sermon on the Sorrows of Mary and Novena Prayers (see below). The evening Mass is followed by an hour of Eucharistic Adoration, during which confessions are heard; the adoration concludes with Night Prayer (Compline). This year the sermons are being given by Father Augustine, Father Anthony and myself. and you knew then that you would be asked to suffer with Jesus. the grace that I may always remember my death, which will help to keep me form all sin. O most holy and afflicted Virgin, Queen of Martyrs, who stood on Mount Calvary when your Son was in agony: by the sword of sorrow which pierced your heart, by the sufferings of your whole life on earth, by your unspeakable joy in Heaven; look down with maternal pity and tenderness as I kneel before you to sympathise with your sorrows, and to place my petition, with childlike confidence, in your wounded heart. I beg of you, dear Mother, to plead for me with your divine Son, since he can refuse you nothing, and, through the merits of his most sacred Passion and Death, together with your own suffering at the foot of his Cross, so to move his Sacred Heart that I may obtain this request…. To whom shall I go in my need and misery, if not to you, O Mother most merciful, you who pity us poor exiles still sighing in this valley of tears? Offer to Jesus for us but one drop of his most precious blood, but one pang of his loving heart; remind him that you are our life, our sweetness and our hope, and your prayer on my behalf will be heard. Amen. and you had to flee with him to Egypt, to save him. on the difficult road to heaven. Here add the Prayer to our Sorrowful Mother for a particular grace and the Memorare (see above). while you looked everywhere for him. but always to remain united to him by the help of his grace. when you followed your dear Son to Calvary, and saw him falling under the wieght of the Cross. to bear with patience whatever cross it will please God to send me. without being able to do anything to help him. I may obtain the grace of a happy death. was taken down from the Cross and laid in your arms. so that I may be perfectly inited to him for ever in heaven. was taken from your arms and placed in the grave. and a tender and practical devotion towards you. Today we pray the Prayer to our Sorrowful Mother for a particular grace and the Memorare (see above). Hope it is a great sucess for all the souls who partake. Thanks for the plug, Paulinus. on 8 September, 2006 at 1:26 am | Reply Don Marco, O.Cist. Dear Father, Laus Crucis is splendid! I invite you to visit my page sometime. Oh, Immaculate Mary, Virgin most Powerful, I beseech you, through that immense Power which you have received from the Eternal Father, obtain for me Purity of heart, – Strength to overcome all the enemies of my soul; -and the special favor I implore in my present necessity. Mother most pure! Forsake me not, despise not my prayer, graciously hear me for God’s glory, your honor, and the welfare of my soul. Oh Virgin Mary, My Mother, through that ineffable Wisdom bestowed upon you by the Incarnate Word of God, I humbly beseech you, obtain for me Meekness and humility of heart; – a perfect knowledge of the divine Will and strength to accomplish it always. Oh Mary, Seat of Wisdom; as a tender Mother lead me in the path of Christian Virtue and perfection; enlighten and enable me to do what is most pleasing to your beloved Son. and obtain my petition. Oh, Mother of Mercy, Mother of penitent sinners, I stand before you sinful and sorrowful, beseeching you through the immense Love given to you by the Holy Spirit for us poor sinners, obtain for me true and perfect contrition for my sins, which I hate and detest with all my heart, because I love God. Mother most Merciful, help me in my present necessity. Turn, then those eyes of Mercy toward us, Oh Clement, Oh Loving oh Sweet Virgin Mary! I promised to publish this novena on the ninth day. Oh, most beautiful flower of Mt. Carmel, fruitful vine, splendor of Heaven. Blessed Mother of the Son of God, Immaculate Virgin, assist me in my necessity, Oh Star of the Sea, help me and show me here you are my Mother. Oh Holy Mary, Mother of God queen of Heaven and Earth, I humbly beseech you from the bottom of my heart to succor me in my necessity (make request). There are none that can withstand your power. Oh Mary, conceived without sin, pray for us who have recourse to thee (say three times). Holy Mary, I place this prayer in your hands (say three times). Amen. on 16 January, 2008 at 8:48 pm | Reply Jessica S.
Saddened Mother of Sorrows, Virgin Mary, Our Lady that has arrived after tracing the steps of your only begotten son, our Lord Jesus Christ, the Calvary Spirit to where the Holy Spirit hath invited you. Embrace oh Mother the sorrows that await thee and offer these to the Eternal Father so that my hardened heart can be softened. Grant me of your son the petiton (say request). Glory Be his. (7 Hail Marys.) Amen. Thank you my merciful Lady of Mt. Carmel, thank you to Our Lady of Sorrows for hearing my fervent prayers,I await in joyful hope for your answer! HAVE BEEN LOST AND DYING THEY MAY FIND GOD. AMEN. Aloha and thank you Father Paul Francis for this post. I went for Kindergarten at Our Lady of Sorrows in the Philippines. Recent trials and tribulations are teaching me a lot. Please pray for me and my family. I’m forwarding this page to my parents and Ronald. God bless and take care and our best regards to Father Anthony too. A friend saw this published and passed it on to me. In accordance with requirements I have published it. To my knowledge, at this moment, my petition has not been granted but I wait for my prayers to be ansewered with trust and faith. Remember, O most gracious Virgin Mary that never was it known that anyone who fled to your protection implored your help or sought your intercession was left unaided. Inspired by this confidence, I come unto you, O Virgin of Virgins my mother to you I come, before you I kneel sinful and sorrowful, O Mother of the Word Incarnate despite not my petitions but in your mercy; hear and answer me Amen. Holy Mary Mother of Christ Pray for us sinners. (7x) in honor of sorrowful Mother Mary.